My father was a senior naval officer who watched the first episode of “Sea Hunt” with me back in 1959 while we were stationed in Key West, Florida. The exploits of Lloyd Bridges as underwater hero Mike Nelson sufficiently impressed him with scuba diving that he let me take one of the first local courses offered back in that era. I was already a very active snorkeler and freediver and he figured that I could handle the challenge. Interestingly, I saw a shark on my first dive… under a fishing charter boat at the dock where my lessons were taking place. My instructor, who never actually went in the water with me, was cleaning grouper and snapper on the pier and tossing the discarded parts in the harbor. I was eight years old and surfaced briefly to report on what I’d seen. My mentor told me not to worry about a reef shark and to finish my “ditch & don” exercise so he could “pass me” on the scuba course and let me start cleaning the bottom of his boat hull of barnacles and seaweed. So I guess, in retrospect, that I earned my c-card and several “specialties” the same day in “Shark ID” and “Bottom Cleaning”. My instructor was more worried that the shark was going to frighten me off and he’d miss out on the $15 training fee. And, of course, the free hull scraping that he’d already assigned me to complete. A few years later, I started a fish trapping business and sold my live catch of angelfish, parrotfish, tangs, yellowtail, grouper, and hogfish to the local municipal aquarium. Some weeks I made over $75… a fortune at the time for a 10-year old. But since I didn’t have a driver’s license, I had to hire a 22-year old Navy ensign to drive me from the dock to downtown Key West to sell my wares. This was more than a bit ironic since I was actually making more money than the young naval officer was back then. And he did not like sharks at all. Part of this was probably from his origins in landlocked Ohio. This became an issue when the Aquarium asked if I could catch some sharks for their big tanks that would thrill the tourists. I got some bigger traps and managed to coax some small sharks into them with chum and fish carcasses and created a whole new division of my little enterprise. But my Navy assistant flatly refused to help remove the sharks from the traps when we hauled them up. Now this was hitting me in the wallet since sharks were getting me nearly three times what I was paid for reef fish. So I had to let him go and get an older grizzled character that was pushing nearly 30 years of age to help me. And he wanted to get paid more. I had no choice but to agree since I couldn’t legally drive. And couldn’t see over the steering wheel anyway. So I decided to make him a partner. It diluted my profits but ended any discussion of the hazards of our joint venture. I was off on my entrepreneurial path and I was still in the 5th grade. Later when I was recruited right our of college into a Navy experimental diving project filming fast attack submarines in 1971, our team quickly found out that we had a lot of problems with aggressive oceanic white tip pelagic sharks in the deep Caribbean waters where we worked. Sometimes we’d have scores of these big fellows attracted to our support ship and crew members would have to push them out of the way with boat hooks so we could jump in the water to start our dives. One day when one of the sharks bit the flipper right off one of the divers, we aborted and climbed back aboard. The captain immediately met us on the working deck and explained that this was an extremely high priority mission and that he had the authority to offer us a “hazardous duty” pay supplement of $25 a week. Again, that was a fortune back then… nearly a 25% increase! So we scrounged another fin for the guy and went back in. It was simple economics. When that project ended, I went into commercial diving on a project using TNT explosives in what were called “shaped charge arrays” to blow up the bottom of the channel that Hess Oil used for their oil tankers. When these massive TNT racks were set off they caused a surface pillar of water that shot up to 30 feet into the air… usually carrying a lot of incidental reef fish kills with it. Within minutes, the reef and bull sharks moved in for feeding and chaos ensued since a lot of the nearly 120 divers on the project wouldn’t go back in the water until the sharks cleared out. But others of us saw financial opportunity raise its head again and armed with bang-sticks of the era we’d go back to work… for another pay raise. Frankly, I think if they asked us to dive in a nuclear reactor in swimsuits we’d have done it… if the price was right. Sharks continued to be part of my business model when I started my first company V. I. Divers Ltd. in St. Croix in the fall of 1973. Now I found that there were two types of diving tourists: those who were excited to see sharks and others who would pay more to be guaranteed that they would not. We accommodated both and quickly learned to charge the first group extra as well for the “risk” we were taking to show them the occasional reef shark or giant nurse shark that could be found. No… to our horror, diving certifications in North America plunged nearly 70% in the aftermath. We depended on those new entry divers to fuel our dive trips and fill my wallet. And now some skinny kid director named Steve Spielberg and a Princeton novelist named Peter Benchley had just sabotaged my business model! I needed divers to fill my boats and most of America and Canada seemed to have taken up golf or bowling. It took nearly two years to get people back in the water again. My dive tour business was off nearly 40%. A vicious hit to my wallet just when I thought I had some insight to the burgeoning diving industry. But we were not ones to simply accept our fate. We found out that scaring the holy hell out of people was actually good business if we lent ourselves to the various silly television specials that quickly came into production with nonsensical themes like “shark tagging” competitions. The first one came down to the Virgin Islands in 1976 with luminaries like Ron and Valerie Taylor to judge the performance of then-unknown heroes like Howard Hall and Stan Waterman’s son Gordy who got paid a pittance to compete against others desperate for cash, a cheap hotel room, and a couple of Pina Coladas. I rented several boats and support staff to these types of productions and made a small fortune. There was only one problem: we hardly ever saw any sharks. In fact, Howard won the contest when he tagged the only shark we ever saw in nearly a week of filming off St. Thomas. More than once, Ron Taylor would suggest something radical like, “If ya wanna do a shark competition, let’s make off to Dangerous Reef in south Australia and I’ll promise ya more great whites than kangaroos on ANZAC day.” But this didn’t go over well with most of the competitors and airfare to Sydney was a bit steep. Secretly, I sighed with relief when the various television producers chose to ignore one of the world’s leading experts on sharks and kept coming back to the nearby Caribbean with their budgets. Now if we could only come up with some sharks. We’d managed to cultivate a few bull and lemon sharks off the small cayes by chumming like mad and that kept the money streaming as fearless teams of “competitors” would be brought down to stick a tag from a long pole into the back of a lemon shark about six feet long that was thoroughly disinterested in the whole process once we ran out of fish heads and carcasses. Oh, and did I mention that they accomplished these feats from the safety of massive shark cages? Again, we were not about to argue with the scripts as long as the Hollywood guys showed up with money. In 1979, I think we hit the pinnacle of absurdity. A new cable network called HBO contacted me about their concept for a really daring new idea for a shark special: the fearless hero competitors would work without the safety of cages! When they breathlessly previewed this revolutionary idea, I immediately agreed. And raised my daily rate for boats and staff. The producer/director then asked me the key question that would be determining factor as to whether he could get the budget from HBO: “Can I guarantee sharks?” He’d seen and heard about the previous TV specials that had about as much action as a mid-afternoon soap opera and wanted me to confirm that I could find sharks and get them in the camera frame. I swallowed hard, patted my wallet, crossed my fingers, and swore that I could produce more sharks than confetti on New Year’s Eve. Because I had an ace in the hole. I was part of the Virgin Islands National Spearfishing team since 1971 and we had long ago stopped hunting the bottom reef fish since it was too easy. We’d taken up pursuit of offshore pelagics like dolphin (fish), kingfish, tuna, wahoo, and other big fellas out there in the blue bottomless depths of the ocean between St. Croix and St. Thomas. We also dealt with the constant “up close and personal” attention of the aggregations of oceanic white tip sharks that I had first been introduced to back during the Navy project eight years before. They were everywhere and easily attracted. Give me a bag of chum and a couple of tuna chunks and I’d have 30-40 wonderful shark “actors” in about twenty minutes. So down came the film crew, producer, director, and the HBO guy with the checkbook. They chartered two of my boats and staff for eight days. And they hand-picked three teams of fearless shark tagging competitors to show off their skills. We met that first evening and I let them tour the dive vessels, meet the staff, and then pulled out the chart to show them our intended filming location about five miles north of St. Croix where we had already scouted our rich resource of oceanic white tips. I showed them some film I’d already shot of these active 8-12-foot predators and waited for the hand-clapping enthusiasm to flow forth. Wrong. It seemed that the chosen “professional shark divers” flatly refused to dive with oceanic white tip sharks under any circumstance. These sharks had a bit of a bad reputation for their aggressive behavior and reckless chomping on anything within range. So without further discussion, I was ordered to come up with an alternative plan. I didn’t have one since we really didn’t have much of a shark population in the Virgin Islands and I thought the idea of the oceanic white tips was perfect. I even reminded them of the great sequence from “Blue Water, White Death” that showed the Taylors, Stan Waterman and Peter Gimbel cavorting with hundreds of them as they fed on a whale carcass off South Africa. This retrospective only served to fuel the absolute denial of any such diving. So we spent a week desperately trying for any sharks we could attract around the coastal reef areas and completely struck out. Mind you… I was getting paid top dollar anyway and really didn’t see it as my fault that the chosen competitors seemed to come up a little short in the “cojones” department. Finally, the director quietly came up to me and said he was out of money but had heard that some guy in San Diego was having some luck finding blue sharks. Since this was practically in the director’s back yard, I urged him to get in touch with this upstart… a guy named Howard Hall. So we put the HBO crew back on a flight home and they went out for a day with Howard and two other guys on an outboard boat off San Diego. They got more sharks in one afternoon than any of these silly shark competitions combined to date. The director even managed to provide a key big finish to the film when he accidentally got bitten in the head by a six-foot blue shark in the midst of all the chum. Yeah, that’s the stuff action documentaries are made of. 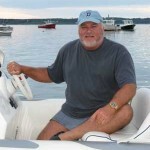 Bret Gilliam is a 44-year veteran of the professional diving industry and has worked on scores of movie and documentary films and well as being extensively published. He is one of diving’s most successful entrepreneurs and was inducted into the AUAS Diving Hall of Fame in 2012.